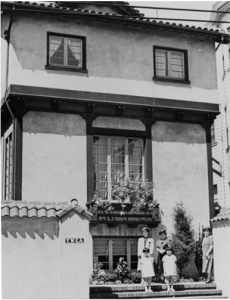 SAN FRANCISCO – Nihonmachi Little Friends (NLF) will celebrate the 80th anniversary of its 1830 Sutter St. building with an open house on Saturday, Sept. 29, from 1:30 to 4:30 p.m.
Prewar photo of the Japanese YWCA at 1830 Sutter St. The event, held in conjunction with Julia Morgan 2012 Festival, will feature a guided tour of this historic building, located on Sutter Street between Buchanan and Webster in San Francisco’s Japantown. The Julia Morgan 2012 Festival is a statewide celebration through mid-November, showcasing the life and works of Julia Morgan (1872-1957), California’s first licensed female architect and the creator of over 700 structures in California alone, including Hearst Castle in San Simeon. Organizations from across the state are participating with a variety of activities, such as visual and performing exhibits, seminars, teas, Morgan-designed building tours and garden tours. Formerly known as the Japanese YWCA, 1830 Sutter was built in 1932 by Morgan and offered temporary housing and cultural and social activities for young women and girls. Morgan considered the building to be a homage to Japanese architecture and donated her services and building design. The building contains an authentic noh theater stage and ranma (decorative wood panel) by noted Japanese American artist Chiura Obata. The stage, ranma, and many distinctively Japanese architectural details still remain intact. 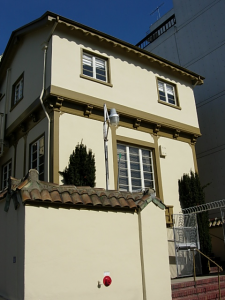 Today, 1830 Sutter is home to NLF, a Japanese bilingual and multicultural child-care organization that helps instill in the next generation the values and principles that have been important to keeping a vibrant community alive. Established in 1975, NLF has operated preschool and after-school programs at three Japantown locations: Christ United Presbyterian Church, Kinmon Gakuen, and the former YWCA building. The 1830 Sutter building in 2008. NLF successfully completed its $2.2 million capital campaign to fund the purchase and renovation of the Sutter Street building in 2009, continuing to preserve the Issei women’s legacy that created this community treasure. The Julia Morgan 2012 Festival is a pilot project of Landmark California. Other participating organizations include Asilomar State Park and Conference Center, the Annenberg Beach House, the Berkeley City Club, the California State Library, the Chinese Historical Society of America, the Hearst Corporation, the Los Angeles Conservancy, Mills College, the Native Daughters of the Golden West, the North Star House, the Riverside Art Museum, and the San Francisco Zen Center. For more information, visit www.landmarkscalifornia.org.